If you are like me, you get bored shopping. Wandering around retail stores looking for inspiration. With more and more competition on the high street, a positive and immersive consumer experience is becoming more and more vital to not only retain custom but to attract them in the first place. Digital Signage can make the difference. 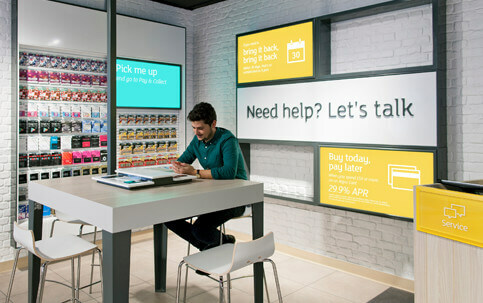 ‘Digital Signage captures 400% more views than static signage’ – Intel Corp, so this is your chance to make your business stand out from the crowd and grab consumers attention. Digital Signage is an ideal communication channel, not only does Digital Signage capture 400% more views that static signage but the human brain processes visuals 60,000 times faster than text – 3M. 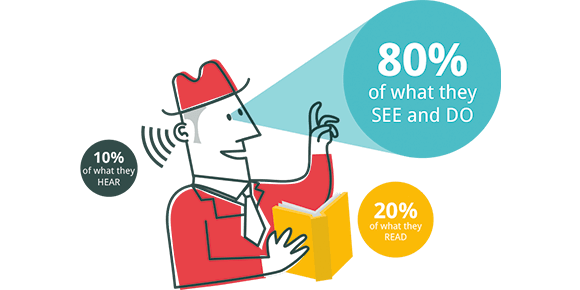 Furthermore people remember 80% of what they see compared to reading – Lester, P. M. 2006. Make sure you utilise the power of animations and strong visuals to get the customers attention and to reinforce your brand through digital signage. ‘55% of customers would pay extra to guarantee a better service’ – Defaqto research. This statistic alone shows the importance of creating great customer service. Digital signage and especially touch interactive devices can help create that great service by removing the fear factor of asking ‘silly’ questions or feeling pressured by staff. Customers could have access to the latest offers, product information and pricing without the need of an assistant showing them. Additionally by providing access to things like FAQs or a ‘call assistant’ button can be used to further enhance your customer service. Bring in things like educational videos at the customer service desk for common customer requests such as ‘how do I get a refund for my item’ and this can not only provide insight, comfort and value to the customer but also to alleviate staff queries, thus using their time more efficiently. Ever grabbed a packet of mints at the last moment at checkout? I have. Digital Signage can increase the chances of an impulse purchase between 18% and 20% – Talk Retail. This in turn could generate a huge revenue stream depending on the volume of consumers passing through your store. Waiting in line at checkout can be an annoyance at one of the final stage’s of the customer journey. ‘Digital Signage can reduce perceived wait times at checkout by as much as 35%’ – Lavi Field Study. This in turn helps to create a positive brand experience and can lead to repeat custom. Use displays to not just distract the customers from their pain but inform them, reinforce brand messaging and promote future releases. At this stage, your audience are captive and this is your perfect opportunity to ease their pain of waiting in a positive manner to benefit your brand. Don’t fall at the final hurdle. Advertising products via digital signage in-store or in a store window, will aid the decision making process substantially, with an increase of up to ‘33% additional sales when using Digital Signage’ – Nielsen. 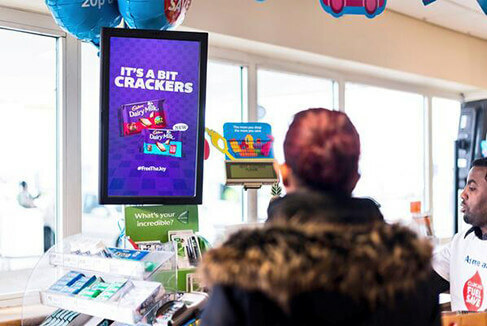 Using digital signage to advertise products in-store not only benefits the advertised product by up to 33% but there is also a significant halo effect. As much as 7x sales increase on the family of brands advertised on digital signage and an even more significant 11x sales increase on the overall product category [*Raymond R. Burke, Journal of Advertising Research, Vol. 49, No. 2, June 2009, pp. 180-185]. This highlights why the implementation of digital signage to promote products in-store is an extremely valuable way for all brands to benefit. High-bright screens with high-contrast ratios will be needed for storefront window displays in order to to maintain view-ability in bright conditions. Window displays can be an extremely powerful tool in generating more customers with ‘One retailer noted a 24% increase in footfall after implementing Digital Signage’ – Computacenter. How about using motion activated content so when customers pass by they trigger your engaging content that really draws them in? Window displays act as the starting post for the in-store customer journey, this makes them an invaluable tool. Your brand is only as strong as your customers portray it to be. There are numerous ways in which to engage with your customer base in-store, interaction with signage is a great way to do so. ‘70% of buying experiences are based on how the customer feels they are being treated’ – McKinsey, Digital signage can make the customer journey as easy as possible as well as interactive and entertaining. Providing product information through well designed touch interfaces or gamification will help the consumer enjoy their in-store experience while delivering key messaging. The serendipitous nature of this type of experience could also lead to an increase in sales for a wide variety of products. Getting the latest information and pricing on-the-fly helps customers self-serve and make detailed product decisions all without the requirement of staff intervention. Digital ticketing can offer product information instantly and can be placed right next to the product on display creating an immersive and personal experience for the customer. Ordering at home and collecting while you’re out is becoming increasingly popular with approximately 500,000 click and collect locations in Europe – Deliotte. By using Digital Signage to help deliver and communicate those services instore will help automate the transaction process further. From simply displaying order numbers on screens for customers to visually track the status of their order to the barcode scan and collect units that confirm you are ready to collect your order, Digital Signage can be used to aid the in-store experience of the customer for click and collect with minimal input from store staff. Displaying content at the right time in the right place is a critical part in making digital signage work for your brand. Specifying content to play on a certain day, time or date range to tie in with integrated campaigns is essential, but what about being reactive to the weather? Having the ability to dynamically schedule content to display based on the weather gives your brand the added benefit of being instantly reactive to the environment and increases your chances of selling relevant items. As an example; if it’s a hot summer’s day and the temperature at your store location exceeds 20°C/68°F your pre-scheduled content can automatically kick in and begin showing promos for a new range of sunglasses. Dynamic data can the previously laborious and costly task of changing data and pricing on signage a thing of the past. The use of APIs, Excel spreadsheets, RSS and XML feeds can dramatically increase the speeds of content updating, giving you more time and resources to focus on other areas of the business. Mounting tablets onto a shelf that display product information offers a highly efficient and cost effective way of giving consumers the information they want, when they need it. No more hunting for the assistant! Product offers, reminders and advertising could all be placed and scheduled on the tablets. Device to device interaction can be an extremely useful tool in pushing content to your screens instantly. For example if an emergency occurred, at the push of a button on a phone app you could instantly change your in-store digital signage telling visitors to leave at the nearest exit. 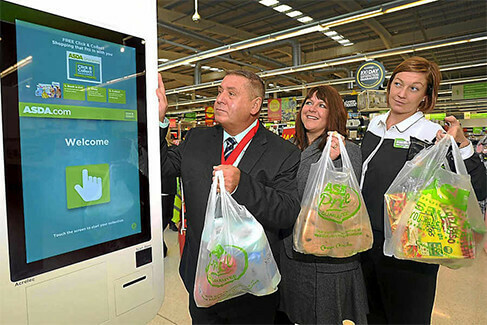 Away from the health and safety benefits, using this type of device to device interaction can be used to engage consumers and even interact with stores displays using smart devices. Providing this type of experience and gamification not only offers entertainment for the customer but also great opportunity for free advertising through word of mouth. Device to Device interaction with Screemo for Three Mobile by Realisation. ‘Lift and learn’ is an interesting way for consumers to interact with products. 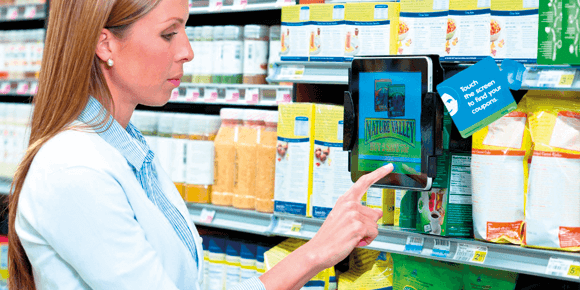 When a consumer lifts a product off the stand, product information can automatically be activated on a screen giving further product information. 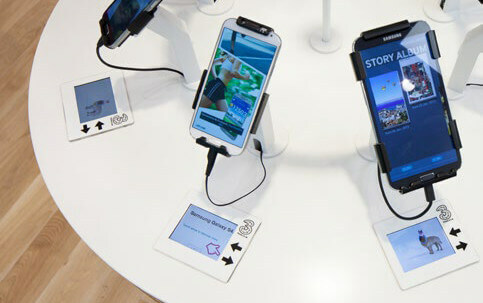 QR Codes or NFC could also be implemented for further device interaction. 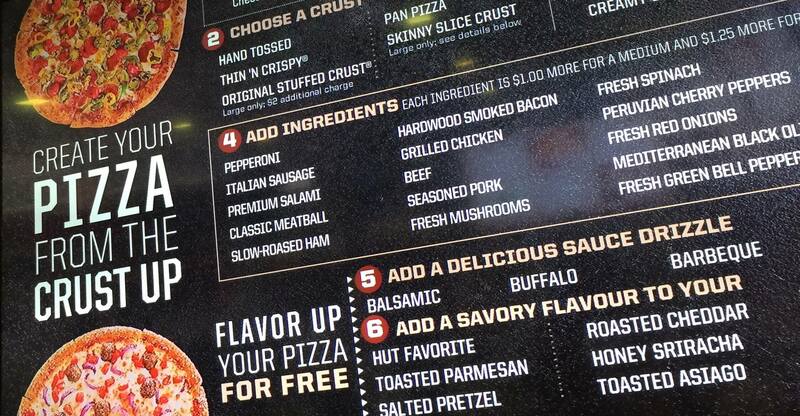 Consumers could activate redeemable vouchers / codes via their phones after interacting with digital signage in-store. More and more businesses are realising the power of digital signage. 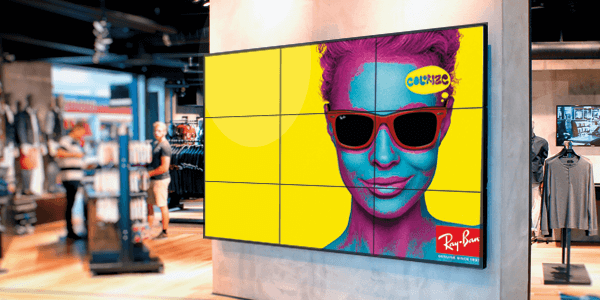 Providing customers with an immersive and accessible in-store experience using digital signage is becoming a vital part of a retail store and offers a way to make your brand stand out from the rest. Thanks for reading, feel free to share your thoughts with us! Leave a comment below and let us know how digital signage is transforming the in-store experience for you. If you’ve not using digital signage yet, give it a try. Sign up for a free embed signage account or get in touch with us here.